Welcome to June and the wonderful months of summer. Please be sure to review dog safety for the warm summer days. We’d like to thank Martha Mullis for being willing to write a lovely member article for this issue. We really enjoyed hearing about how she got started in springers and life with her first springer, Lucky. I was introduced to the wonderful world of English Springer Spaniels by a kind lady at Chow-Chow Rescue. Ms Ellen Quillin had taken in a young stray male Springer at her plant nursery near the tiny former settlement of George east of Estacada, Oregon. He was about 10 months old, skinny, matted, and had a shock of bleached orange hair on his head. I adopted him on Saturday, November 2, 1991 after mentioning on Thursday that I would probably need a younger dog to begin agility training. I had no sooner made it home from obedience class than the phone was ringing, telling me of a perfect agility candidate: would I like a liver and white Springer boy to train? Yes. 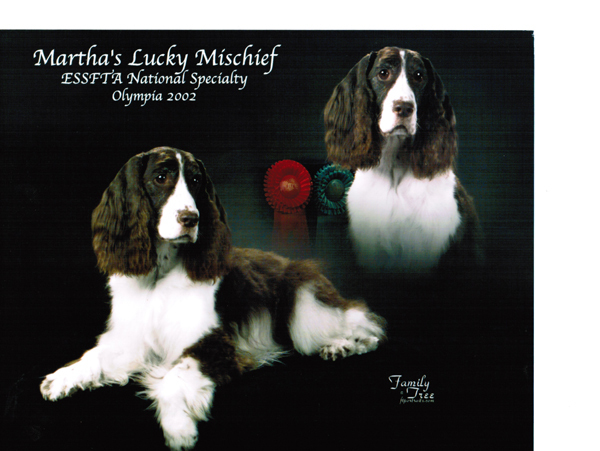 I named him Lucky, and later got an ILP under the name Martha’s Lucky Mischief. He earned the second name for sure. Lucky settled in with three cats and my older dog, Rudy. He was very gentle, but extremely active and had a blockbuster case of separation anxiety. I had experience only with “Saint” Rudy, my first dog, who would never do naughty things like tunnel through a hollow-core door, chew the feet off my Osterizer, or crunch a drinking glass on the kitchen counter. Now I was in the soup. I took advice on crate-training, but he was a terrific escape artist and learned to open his wire crate. He was miserable when my husband and I left for work, even though he was alone for only about 4 hours at a time since Steve came home for lunch at mid-day. But I was determined to keep him, since he was never snippy with people or other animals, and charmed us with his playful nature. It took about two months, but eventually Lucky calmed down and learned that life would not end if he were home without people. He became a great traveler. We went as far as Moscow, Idaho for our CGC test where our “crowd” was a group of Japanese exchange students on bicycles! We took obedience and agility classes where Lucky did well. During agility class, I met Jan Martin. She invited me to come to a WVESSA meeting and soon I was an associate member. Lucky and I tried our hand at an obedience trial, but the silence in the ring seemed to discomfort him, and I was a bundle of nerves. He was also too wiggly to stand-for-exam. We put aside obedience for a few years. Later Lucky earned his CD when he was 11 years old. We met Elaine Resner, who encouraged us to try hunting. Lucky was six when we started, and he was a natural. We earned a WD and after about a year, we earned a Junior Hunter title. I think hunting was his greatest joy. He did agility with one eye on the sky for birds, and did obedience only to humor me. Twice we took him on planted hunts in eastern Oregon, and he ran joyously for hours. He followed the gunner up hill and over rocks, and gave him a disdainful look if the man missed his shot. He gave his pheasants only to me, though, avoiding the gunner’s outstretched hands. Lucky was very tolerant of the other Springers that came into our lives. He was the boss, but he never threw his weight around. He didn’t usually play with the other dogs, but played parallel to them. They respected him. I am grateful to Lucky for introducing me to the wonderful world of Springers. He was a great dog, and a great teacher. He lived until February 2008, and passed with dignity at the age of 17 years. The June WVESSA meeting is on Saturday, June 21st at the Clackamas County Kennel Club show in Canby.Gather between 10:30-11:00AM at Ring 5 during springer showing (they show at 10AM) when a meeting location will be determined. Please bring any raffle donations for Debbie and Jeff to take. Raffle committee could use a bottle of wine and a nice cheese knife to go with a great cutting board. Also some dog treats for several empty containers.If you are unable to attend the meeting and have raffle donations, please email Debbie and Chris telling them what you have. Hunter is owned by Gigi Maris. GCH Mar-Ric Sir Jackson Stonewall CGC was Best of Breed on April 27, 2014 at the Walla Walla Kennel Club show. Jackson is owned by Gary and Barbara Stonewall. Oxbow’s Sweetheart of the Rodeo, “Juliette”, was WB,BOW,BOS at the Tacoma Kennel Club show in Puyallup June 8, 2014. Juliette is bred/owned/handled by Dave and Janeé Kemp. Please send your brags to the Kemp’s written as you would like them published. Send any donations to Carol Callahan at her home address as published in the membership list or contribute at a meeting if you give your brag there, but still be sure to send us the written brag.